Abstract: The impact of sea surface temperature rise on corals largely depends upon heritable species adaptation. Heterotrophy has been shown to increase corals' tolerance to thermal stress and is a parameter which may potentially alter alongside climate change. 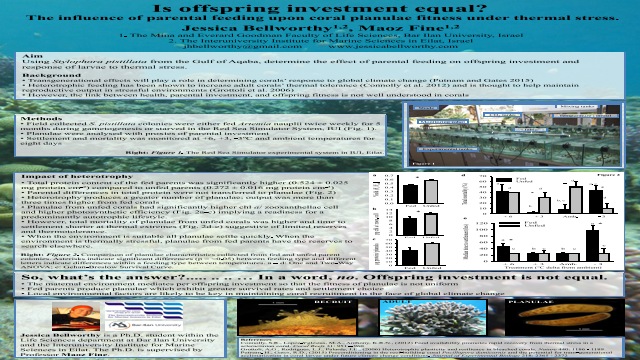 However the link between health, parental investment, and offspring fitness is not well understood in corals. Adult corals from the Gulf of Aqaba show relatively strong resistance to experimental thermal stress but the thermal tolerance of their planulae (larvae) and the effect of feeding on offspring investment has not been investigated.